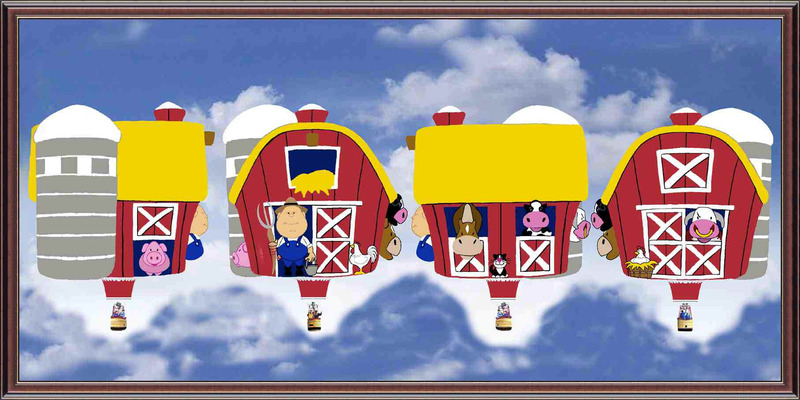 The Old McDonald's Farm Hot Air Balloon has been constructed by the Aerostar© Balloon Company. Design and cut out of the fabric took approximately 4-5 weeks with an anticipated construction and certification time of 120 days. The Old McDonald's Farm Hot Air Balloon will be available for Balloon Festivals and for Corporate advertisement. Imagine the product recognition with a Child's Nursery Rhyme Hot Air Balloon. What child or adult doesn't remember the nursery rhyme Old McDonald Had A Farm E I E I O , none. With this strong association of your product to a childhood memory advertising on this scale, the public will always remember it. Just imagine your company LOGO® on the Silo of this balloon and or your Banner on it's basket with a crowd in the thousands. Some balloon festivals have an attendance of a few thousand with most festivals having a admission of 75,000 or more. When you calculate the cost of sponsorship and the amount of public exposure over a period of 3-4 days it is an extremely cost effective form of advertising. And as a sponsor you also get to enjoy the thrill of being one of the lucky few who experience a balloon flight in this balloon.